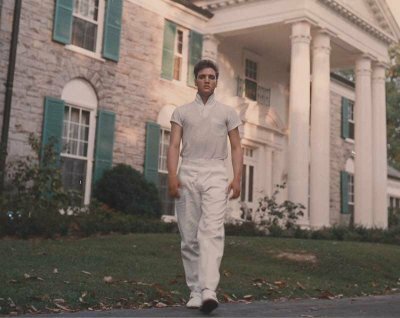 ♥ Elvis in Graceland ♥. . Wallpaper and background images in the Ingrid's Graceland club tagged: elvis presley graceland mansion king of rock. This Ingrid's Graceland photo contains brownstone, street, city scene, and urban setting. There might also be business suit, row house, town house, mansion, mansion house, manse, hall, and residence.